Virtual New Zealand Stamps: 2012 Matariki - Maori Rock Art. 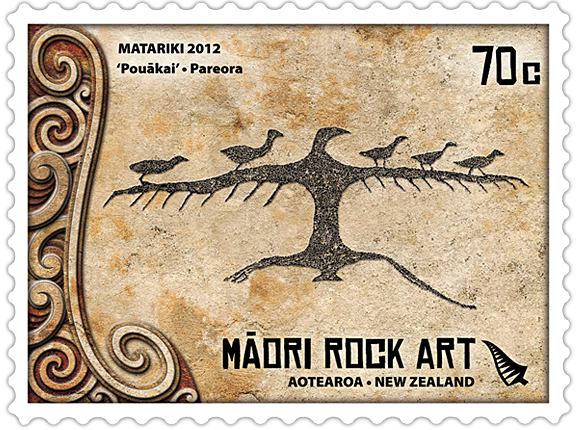 Māori rock art is not as well known as Maori wood carving but examples can be found throughout the country. 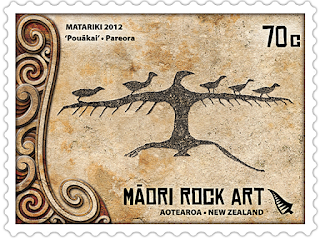 The stamps in this issue depict examples of rock art documented in Te Waipounamu (the South Island) where more than 500 sites have been recorded to date. Rock art is applied to a variety of stone types, and while the common perception is that rock art was created using a burnt stick, the majority of the ‘drawings’ in Te Waipounamu appear to have been applied as pigment in solution. 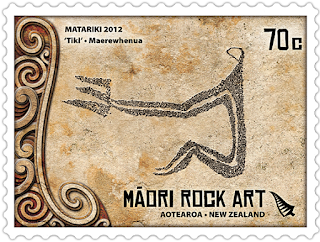 The style of Māori rock art is similar to that from wider Polynesia, suggesting that it was a practice brought to New Zealand by its earliest people. 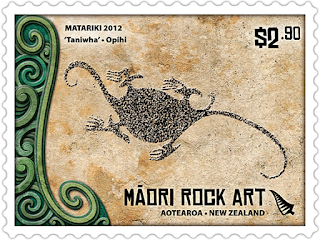 Māori rock art gives a glimpse of New Zealand’s history and culture, and the drawings included on the six self-adhesive stamps in this issue portray animals now long extinct, representations of everyday life and depictions of the supernatural. 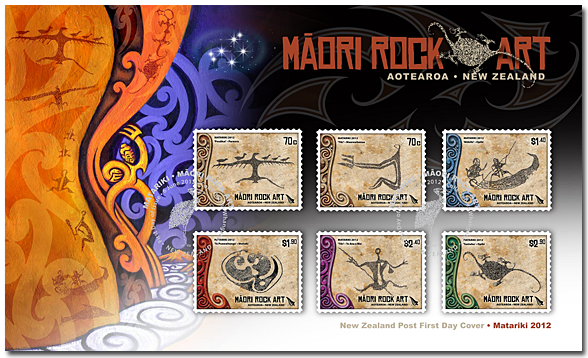 The rauru (spiral design) on the stamps pays respect to Rangi and Papa, and the light and knowledge that came about from their separation. The colours used in the rauru reflect the land and environment, and the koru represent growth and life and pay respect to the past, present and future. 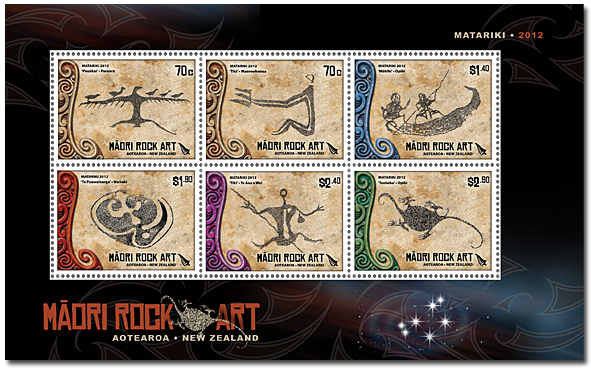 See our Matariki Collection. See our Index - New Zealand Maori. Kurangaituku - The Bird Woman. At more than a metre high, this work is drawn on the ceiling of a small limestone shelter and depicts a seated tiki figure, drawn in profile. Profiled tiki figures such as this are sometimes placed back to back, the figures joining to form the frontal view of a single human figure much the way the birdman is depicted in the top stamp. This drawing is thought to show two people on a mōkihi, a watercraft made from raupō (bulrush) used to navigate the fast-flowing rivers of the southern regions. Rock art sometimes depicts everyday activities, giving us rare glimpses into the lives of the ancestors. 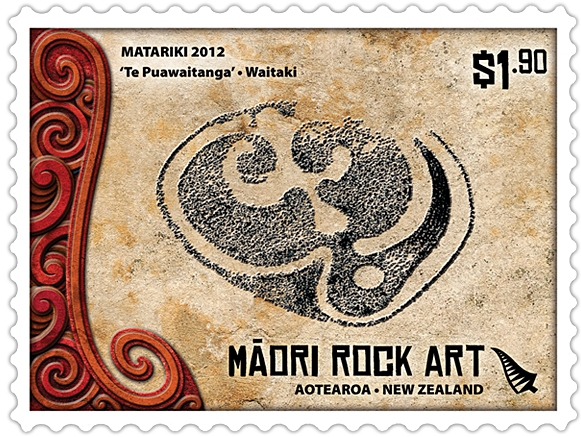 $1.90 - Te Puawaitanga, Waitaki. This unique figure is commonly interpreted as a kiwi chick within an eggshell. 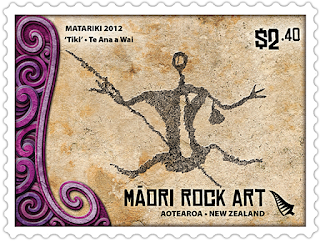 Copied from a site on the banks of the Waitaki River, this image is one of the most frequently re-used rock art designs in contemporary Ngāi Tahu culture. 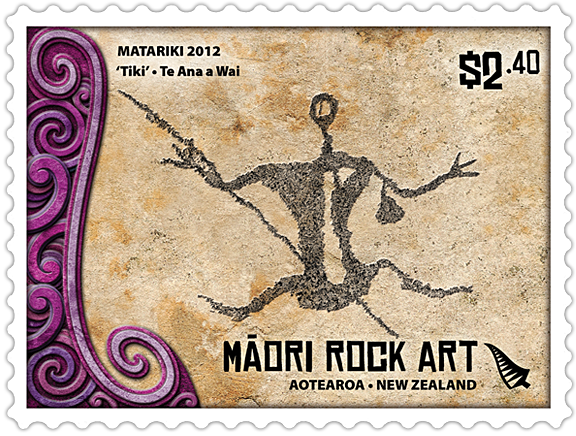 $2.40 - Tiki, Te Ana a Wai. Tiki figures may symbolise the people of the time, their ancestors or perhaps the generations to come. This drawing features one of the classic design elements in southern Mäori rock art - the blank central space in the body and head of the tiki. 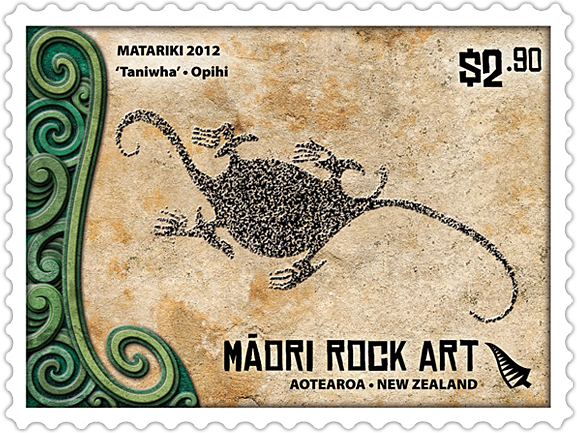 Drawings capturing supernatural taniwha can be found at a number of rock art sites in Te Waipounamu. This figure is one of two large interlocking taniwha. The entire composition is more than four metres wide, drawn on the ceiling of a shelter near the Opihi River. 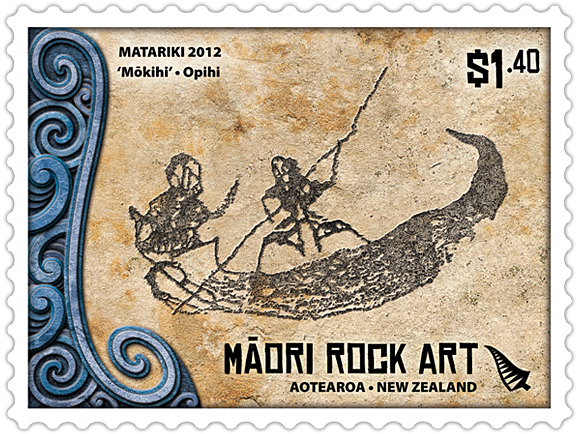 2012 Matariki - First Day Cover. 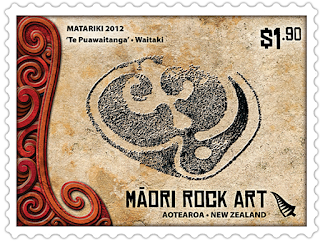 2012 Matariki - Miniature Sheet.